High profile speakers from world of Augmented and Virtual Reality to speak. EXPO to showcase best in AR and VR. 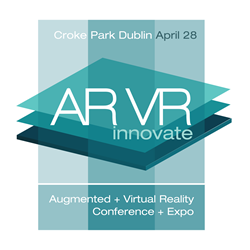 Building on the success of the past two years, the 3rd ARVR Innovate Conference and EXPO will take place at Dublin’s Croke Park Conference Centre on Thursday, April 28th. A move to include an expanded EXPO is indicative of the huge demand for the event and the level of interest from marketers, creative and digital specialists, tourism and events, and production and technology sectors including the engineering, architecture and construction professions. Augmented Reality and Virtual Reality experts – including veteran visual effects luminary former Sony Pictures executive Don Levy - from the US, UK, Europe and host country, Ireland will share their advice and knowledge in how they have paved the way in revolutionising how creativity and technology combine, demonstrating how it is being incorporated into our lives. To maximise the value of the day, a number of distinct spotlight panels have been arranged for Engineering, Industrial, Immersive, Construction and Property sectors. The brainchild behind the conference is Alex Gibson, a lecturer at DIT and broadcaster, whose passion for imparting information and insight is the driving force for bringing business audiences interested in Augmented Reality and Virtual Reality to Dublin for the third time. Announcing the date of the 2016 conference he said, "I am absolutely delighted to hold this conference for a third consecutive year and in a broader format. Having a personal interest is one thing, but receiving such great feedback last year from speakers, attendees and panelists, it underpinned the importance and hunger for knowledge about augmented and virtual reality as a means to help businesses move forward. AR and VR are becoming more integrated as a tool for marketing communications but also as a mechanism within sectors such as medicine, architecture, engineering, gaming and property, so the uses and gains from Augmented and Virtual Reality have never been more in demand. It was vital to secure high calibre speakers and panelists and having personally met and invited them to be involved, it is further proof of just how timely the conference is. I am particularly pleased that we will be joined by Don Levy, who has had a stellar career in the visual effects sector with Sony Pictures, and has some fantastic insights on AR and VR to share." Don Levy has been at the forefront of the entertainment industry’s digital transformation throughout his career as a senior executive in animation, visual eﬀects, digital media, television and movies. After 17 years as a member of the senior management team at Sony Pictures Digital where he was instrumental in the establishment and growth of the studio’s visual effects, animation, post‐production, and digital entertainment businesses. Gaia Dempsey is a creative strategist and pioneer in the field of augmented reality, driving the adoption of DAQRI’s enterprise 4D technology worldwide. Gaia is leading DAQRI’s international expansion and recently opened DAQRI’s first European office in Dublin, Ireland. Feedback was so strong regarding the hands-on opportunity attendees had to experience wearing devices, and explore the applications that it has been brought back and expanded to allow for greater interaction. This is turn provides a demonstration platform that would be of interest to Creatives and Client Directors from the Advertising and Marketing sectors, as well as Chief Technology Officers, Procurement Managers, Marketing Managers, Operations and Facilities Managers. It is anticipated that in addition to client-side attendees, the conference will attract significant interest from agencies who have an influential role on client technology deployment. Included in this group are Digital Marketing Agencies, Business and Technology Consultancies, Branding and Marketing Consultants, Software Development Consultants. Reaffirming the success of the event in the past two years, is the support of US-based augmented reality developers DAQRI, who participated in both 2014 and 2015, and are confirmed as this year's Headline Partner. The 2016 conference also boasts a new website - http://www.innovatereality.com - featuring information about the conference, the speakers and panelists as well as links to latest industry news. Regular updates regarding additional speakers and panelists will also be posted to @ARVRInnovate on Twitter. The ARVR Innovate Conference and EXPO is organised by ARMarketing.org, which aims to build awareness of the commercial opportunities for Augmented Reality (AR), Virtual Reality (VR) and related technologies.